Hi loves! How are you doing today? Ready for yet another new to me indie brand :-)? Today I want to introduce you to Pretty Serious Cosmetics. This brand is based in Australia and besides vegan and cruelty free nail polish, they also create eyeshadow! I really love their mascot Daphne who is present on all nail polish boxes. Maria from Hypnotic Polish was sweet enough to send me two shades to try out, and I was really impressed! The packaging is gorgeous, the bottles are very pretty and the rubberized brush cap works really well, and the brush itself is well cut and of a good size. The polish isn't handmixed but factory made so less chances of variation in consistency and such between batches. 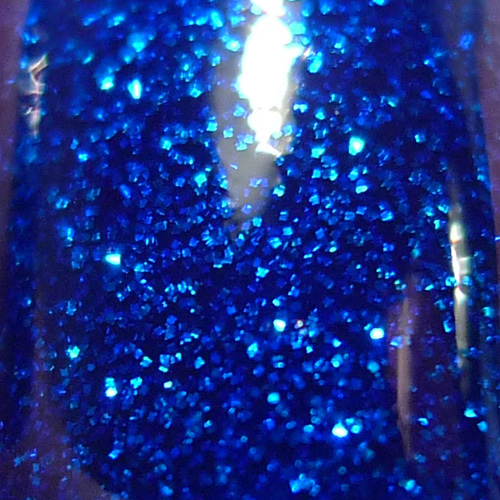 Pretty Serious BSOD is a stunning, even better in real life, blue jelly filled with small blue glitter. The depth in this once you've build it up is amazing, and the sparkle is so good! I really enjoyed this one :-). I needed 3 coats for a proper opacity and application was perfect. Nice thin coats, no clumping of glitter or bald spots. It also doesn't dry gritty so a regular layer of topcoat is enough to give a smooth finish. Pretty Serious The Pink One is a super bright neon pink with shimmer and a blue flash. This was super hard to capture and the only way I could pick up the brightness was by making my pictures more dark than usual. That's why my skin looks all weird, but the color is quite accurate! This one was perfect in 2 coats and again, application was a breeze. Topped with a layer of topcoat you have an eye catching summery manicure! Do you like these 2 shades as much as I do? And do you have any experience with Pretty Serious Cosmetics? Tell me in the comments! Hypnotic Polish is a European based indie stockist that ships internationally. Besides Pretty Serious Cosmetics, they also carry Dance Legend, El Corazon, Smitten Polish, Contrary Polish and many others. For more information check out their Facebook page or follow them on Instagram! I love the blue one! The pink is more classic. Both are awesome anyway! I have not tried this brand yet, I have to!